SAO PAULO (AP) — Three supreme court justices on Monday criticized the son of presidential front-runner Jair Bolsonaro for saying that Brazil’s top court could be closed if it tried to remove his father from the presidency. Chief Justice Jose Dias Toffoli said in a statement that “attacking the judiciary is attacking democracy” as the remarks by Congressman Eduardo Bolsonaro dominated news stations in Latin America’s largest nation. 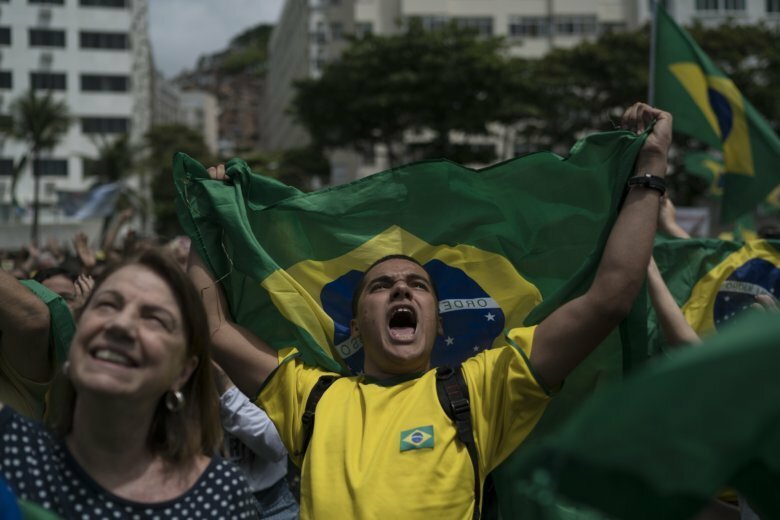 They were reacting to a video released over the weekend that showed a speech in July by Eduardo Bolsonaro to people studying for a national test to become federal policemen. It set off alarm bells in Brazil, which had a military dictatorship between 1964 and 1985. Jair Bolsonaro, a far-right former army captain, leads all polls heading into his runoff Sunday with leftist Fernando Haddad. In the presidential contest’s first round Oct. 7 with 13 candidates, Bolsonaro got 46 percent of the votes, while Haddad finished second with 29 percent. In the video, Eduardo Bolsonaro responded to a question about what the campaign would do if his father won the presidency and was removed from office. Eduardo Bolsonaro speculated that a move to unseat his father could be based on allegations of illegal campaign financing. Brazil’s electoral court opened an investigation into that matter last week. The son tweeted Monday that his statements about shutting down the court were taken out of context. Also Monday, Facebook announced it was removing 68 pages and 43 accounts that promoted Bolsonaro’s candidacy. Facebook said the decision was based on the behavior, not the content, in material linked to a pro-Bolsonaro group called Raposo Fernandes Associados. Raposo Fernandes Associados did not reply a request for comment. Haddad had a small piece of good news, getting the endorsement environmentalist Marina Silva, who was one of the losing presidential candidates in the opening round. Earlier, Haddad said authorities are being cowed by members of the armed forces who endorse Bolsonaro.